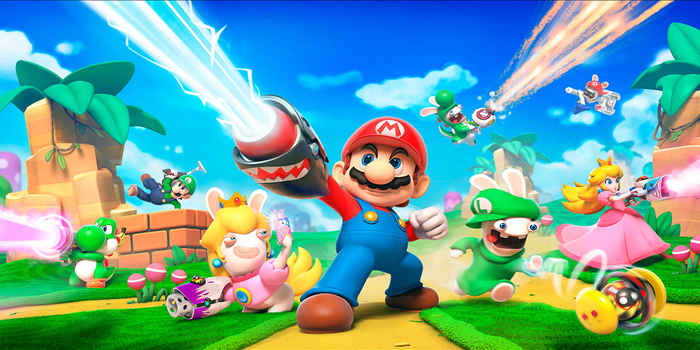 The premise of Mario + Rabbids: Kingdom Battle is as ridiculous and over-the-top as you would expect. A passing glance at the game’s cover art is indication enough that the experience is going to be unlike any Super Mario Bros. title you’ve played before. But the details of the how and why Ubisoft’s lovable white mascots merged with Nintendo’s iconic Mario and the Mushroom Kingdom are of little importance. The real showstopper, is the game’s first-rate approach to the strategy genre, and how it’s amusing yet analytical gameplay-style may very well be one of Mario’s most entertaining outings. Presentation-wise, Mario + Rabbids captures the sights and sounds of the Mushroom Kingdom masterfully. Each of the four worlds is undeniably Super Mario Bros. fare with familiar terrain abound; one minute you’ll be in a desert…that has been wreaked by an ice storm, and the next you’ll be on haunted grounds complete with everyone’s favorite videogame ghosts. Each of the four worlds is divided into nine sub-levels that build up to a halfway point, mid-boss battle and culminate to a grandiose, larger-than-life boss fight. As you explore and solve simple block-pushing based puzzles to proceed, you’ll come across Rabbids hanging out doing…Rabbid things, in addition to the seldom Goomba and oversized Bullet Bill hanging out in the background. It very much looks like a traditional Super Mario Bros. game, but that is of course, until you get to the gameplay. 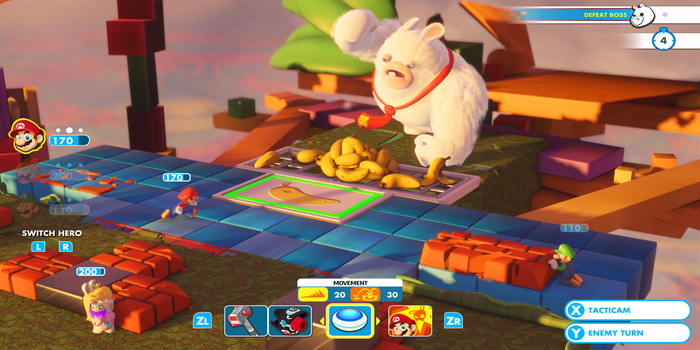 Mario + Rabbids: Kingdom Battle has often been compared to the likes of XCOM, and rightfully so. At the onset of each encounter you are tasked with moving your ragtag team of three along the battlefield, looking for the best possible vantage point while keeping yourself guarded safely behind blocks and out of your opponent’s line of sight. There is a methodical underpinning at work as each move you make may result in either a perfect victory or your own undoing. What sets Mario + Rabbids apart from conventional strategy games is how each of the characters plays off one another – quite literally. Victory comes from set-ups and combinations and using each of the players abilities to gain the upper hand. For example, Mario’s Hero Sight is a passive ability that triggers when an opponent enters his line of sight. 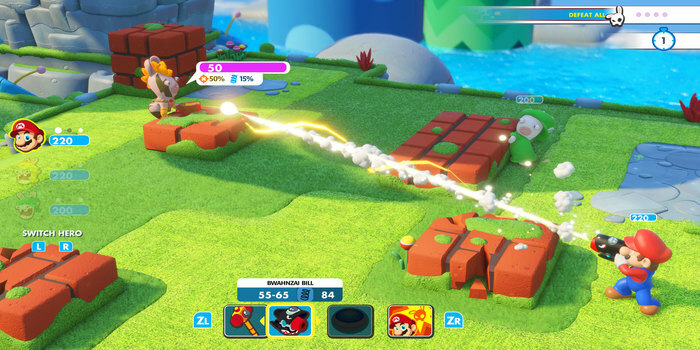 When used in conjunction with Rabbid Mario’s Magnet Dance ability, you can draw enemies closer to Mario thus activating the ability for a free hit. Combinations such as these are absolutely teeming in Mario + Rabbids; its cartoon-ish exterior hiding the surprisingly deep mechanics that lie within. all these abilities can be unlocked via your characters Skill Tree which lets players custom the teams stats and powers to their own liking. In addition, elemental effects such as Burn, Push, Vampire, and Freeze that are assigned to certain weapons, abilities, and environmental hazards add just the right amount of unpredictability to gameplay as a whole. But for as well as it plays, and for how adorable the experience is, one cannot help but feel that the Super Mario Bros. aspect of Mario + Rabbids falls a bit short of expectation. On your journey you’ll find the occasional HP-Restoring Mushroom, but where is the Fire Flower, or the Invicibility Star? Mario is no stranger changing into Toad and Tanooki Suits; how great would it have been to see the plumber don a Rabbid Suit? Rabbid Kong and Pirabid Plant are incredible examples of the mash-up enemies you would expect to see in a game with such a loony, madcap setting. Why then, do the majority of the enemies feel so uninspired by comparison? It somewhat feels like a missed opportunity, one that will hopefully be rectified via add-ons/DLC. But if the recently announced Season Pass is any indication, you would be best to temper those expectations. Technically, the game runs smoothly with the concessional slow-down/frame-rate drop. It’s a minor annoyance and does not hinder the experience at all. The blending of Super Mario Bros. and Rabbids isn’t a perfect union, but it is incredibly hard to put down once you get started. Expect plenty of replay value as each of the four worlds houses a secret sub-level and 10 Challenges, the latter of which can be played solo or locally with a friend. There are hidden chests full of weapons, art, music and 3D models to discover so completionists may expect to play the game after the credits have rolled. Mario + Rabbids: Kingdom Battle is a game no one asked for, but ultimately will be celebrated for its existence. Its the kind of game that you want to see succeed as it opens up a lot of exciting possibilities for Nintendo and 3rd-Party relationships. If you are a Switch owner with even the slightest interest in something other than the frantic action of ARMS or Splatoon 2, then Mario + Rabbids: Kingdom Battle belongs in your library. It’s so stupidly charming that you can’t help but fall in love with it every time you pick it up. Trophy Whores 315 – Dynamic Duo Returns!